The temperatures in The Crest of the Blue Ridge Mountains are crisp and the area is just days away from the highly anticipated change in foliage colors. This all means it’s time for the annual North Carolina Apple Festival. Simple Life is proud to be a sponsor of the event held in downtown Hendersonville, North Carolina, from August 31stthrough September 3rd. “The North Carolina Apple Festival embodies everything Simple Life promotes,” shared Mike McCann, President, “Simple Life embraces living your best life with the idea of getting back to the basics. For our residents, that means connecting with neighbors, enjoying the outdoors and promoting that important sense of community.” This type of lifestyle has been the catalyst for the success of Simple Life’s flagship tiny home community, The Village at Flat Rock, North Carolina, which is located just minutes from the festival. While thousands of people will attend this year’s North Carolina Apple Festival, participants will also have the chance to tour a 400 square foot tiny house. “The reaction is always one of shock and amazement,” McCann said about people who tour a tiny home, “They can’t believe how much livable and usable space can be designed in 400 or less square feet while also still having upscale products and finishes.” The tiny home model will be located across from Krispy Kreme Donuts. 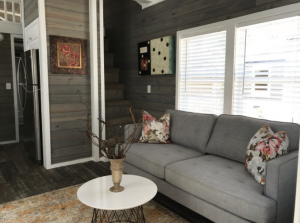 Attendees will also have an opportunity to visit the Simple Life booth and enter to win a free night’s stay in one of Simple Life’s tiny homes at The Village at Flat Rock, NC, which is located just minutes from the festival and will be open for tours throughout the event. Simple Life, a best-in-class tiny home community, is creating a lifestyle where living your best and simple life go hand in hand. Simple Life specializes in upscale living without the headache and upkeep of unnecessary square footage. Through smart, well-designed minimal footprints, Simple Life is inspiring homebuyers to take advantage of the beauty these stunning developments offer. Simple Life resident’s enjoy the views and adventure that come with living in these desirable locations while living a more simple, yet sophisticated life indoors. Residents also enjoy award-winning amenities that compliment active, independent homeowners who want the freedom of living simply and the lifestyle of living like they are on a never-ending vacation. For more information visit www.simple-life.com.